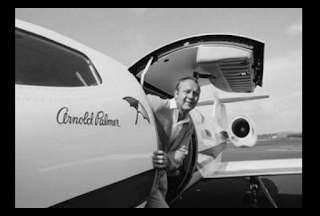 1961, Arnold takes delivery of his first Wichita-built jet, a Learjet. He switched from Lear to Cessna over the years. The whole story is in a column well worth reading by the Wichita Eagle's Bob Lutz. Note: Moved to Saturday to make room for the possibility of important hurricane coverage on Sunday.